This recipe, adapted from one found in a local newspaper, is one I've used for at least ten years. It is a Thanksgiving staple. I usually bake them a few days ahead, careful to bake them just until they're slightly golden. Then I freeze them. Thanksgiving Day I just distribute as many as needed on baking sheets and bake at about 350 degrees for ten minutes, tops, and they're just as fresh tasting as can be. They're a somewhat old-fashioned, very tasty addition to a traditional feast. 1 Add the yeast to the warm water and let it dissolve. 2 In a small saucepan, gently warm the milk. When it just begins to steam, or show little bubbles around the edge, take it off the heat add the butter and let it melt. 3 Put 2 cups of flour in a large bowl. Add the salt and sugar. When the butter has pretty well melted (it's okay if there are still little pieces) and the yeast is pretty well dissolved, add them to the flour. Also add the egg. Mix these together well until it looks like a smooth batter. 4 Mix in another cup of flour, and then the fourth cup. The dough should hold together pretty well, but still have a softness. It should definitely be a dough, not a batter. If needed, add just a bit more flour and mix it in well. 5 Although this recipe calls for kneading, I rarely do. I just make sure all the ingredients are well-mixed into a cohesive dough. 6 Cover the bowl with plastic wrap. Let the dough rise until it is doubled, depending on the warmth of the room, from 45 minutes to an hour. 7 Gently deflate the dough and loosen it from the sides of the bowl. Let the dough fall onto a floured board. 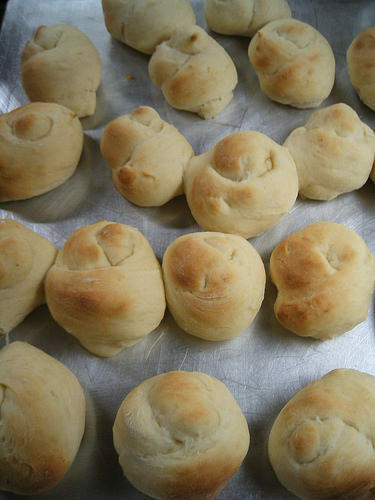 Divide the dough in half and cut each half into 12 pieces. Take each piece and roll into a six or so inch rope. With a rope piece, each end in one hand, tie the ends together leaving a hole big enough so that one end goes around again and just barely sticks through the circle formed to tie the ends together. While this may sound a little mixed up, it really is just like tying a little knot with the little end just sticking through to form ... a bowknot roll! 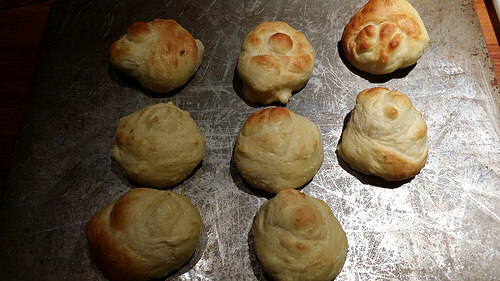 I've found that even if these don't look so great when I place them on a lightly greased sheet ... let them rise until they are just barely doubled and bake them in a preheated 400 degree oven for eight minutes (tops if you're freezing them) or a couple minutes extra if they're going right to the table. They should be a light golden brown. They'll look wonderful, and taste even better!